I was introduced to granola bars by my boyfriend, who is a big fan of them, and I love them. A granola bar with ice cold milk for breakfast or as a snack is amazing! However, a lot of shop bought granola bars are high in sugar, fat and carbs. Preheat oven to 325 degrees. Line an 8-by-8-inch pan with aluminum foil and coat with cooking spray. Set pan aside. In a large bowl, combine oats, both flours, ground flaxseeds, Grape-Nuts, and ginger. Add egg, applesauce, honey, brown sugar, and oil; mix well. Stir in fruit bits, sunflower seeds, walnuts, and chocolate chips. Spread mixture evenly in prepared pan. Bake for 30 to 35 minutes or until lightly browned around edges. Cool completely on a wire rack. Use edges of foil to lift cooked granola from pan, and cut into bars. I love this recipe and I think it might work well with dark chocolate chips and orange segments. Anyone on the go can grab one of these or even put it in your child’s lunch box! 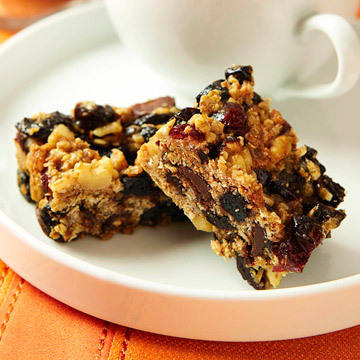 Posted on June 28, 2012 by saritakb	• This entry was posted in Recipes and tagged baked goods, granola, granola bars, healthy, healthy snack, olympic inspired, recipe for granola bars. Bookmark the permalink.